Increase your Arts Card effectiveness by 11%. Deals damage to a single enemy. 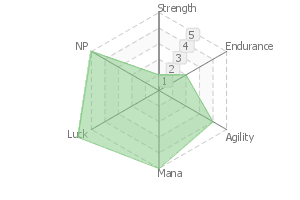 Deals high damage that ignores defense to a single enemy. 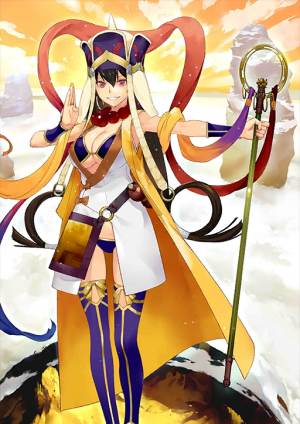 When equipped on Xuanzang, Increases party's Buster performance by 20% and Decreases party's defense by 10% (Demerit) while she is on the field. A Buddhist master who lived during the 7th century Tang Dynasty. In search of the Original Buddhist Scripture, she set out on the Silk Road, traveling from Central Asia to India. At the end, she brought 657 scriptures back to Tang and founded the East Asian Yogācāra sect of Buddhism. She called on of her disciples. Zhu Bajie, by the name "Wuneng" after he stopped eating foods forbidden in Buddhism without being instructed to. A character from the Chinese novel "Journey to the West." By the order of Guanyin Bodhisattva, this beautiful monk traveled to India with the help of White Dragon Horse and her three disciples, Sun Wukong, Zhu Bajie, and Sha Wujing. Together, they overcame obstacles and dispatched any demons that would stand in their way. 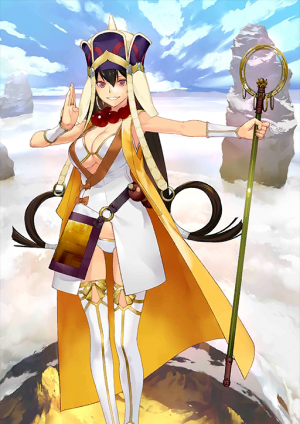 IN "Journey to the West," she was originally known as "Golden Cicada," a disciple of the Buddha. However, she was cast out of Heaven and reincarnated on Earth due to a "certain event." 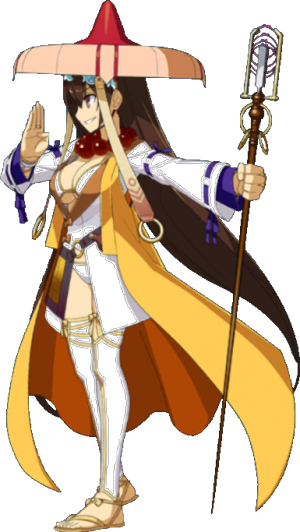 Borrows a tiny fraction of the power of the great Buddha, her former master in her previous life. The "edge of the world" that Sun Wukong once reached - that is, the massive palm of Buddha himself - falls from the sky to crush those who would defy the laws of Buddhism. An Anti-Fortress, Anti-Army Noble Phantasm. The palm strike of the Enlightened One. I'll never drink the waters of the Zimu River again! A Buddhist priest from the Tang dynasty, in the 7th Century BC. Traveling through the Silk Road in pursuit of the original Buddhist scriptures, she reached Tianzhu from central Asia and then brought back to China over 367 sutras, becoming the founder of the Faxiang Buddhist sect. 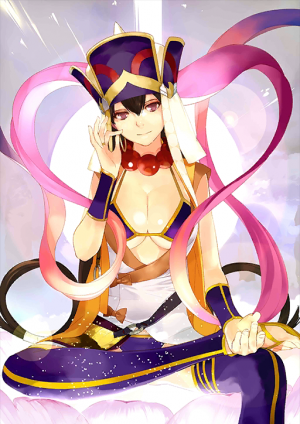 She is known as a key character of the Chinese novel 『Journey to The West』. Under the command of Guanyin Bodhisattva, the monk of good looks who rode Bai-Long Ma - the son of the West Sea Dragon King transformed into a white horse - had Qitian Dasheng Sun Wukong, Tianpeng Yuanshuai Zhu Bajie and Juanlian Dajiang Sha Wujing as her disciples and headed for Tianzhu, without ever losing heart at the countless monsters that obstructed her way. Borrowing a small portion of Siddhārtha Gautama's power, the venerable Buddha and her mentor (of a previous existence) that resides in the heavens. It makes the ｢ Edge of the World ｣ that Sun Wukong supposedly reached - that is, the palm of a Buddha - fall from the skies and chastises the antagonists who scorn Buddhism. Anti-Army and Anti-Fortress Noble Phantasm. The palm heel of Buddha. 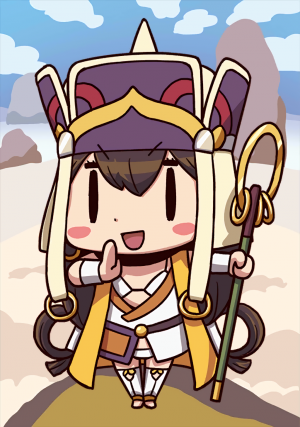 Xuanzang's Buster Attack is based on Zhu Bajie's Nine-Toothed Rake. 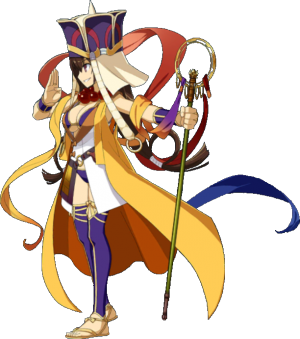 Xuanzang's Arts Attack is based on Sun Wukong's Golden-Banded Staff. 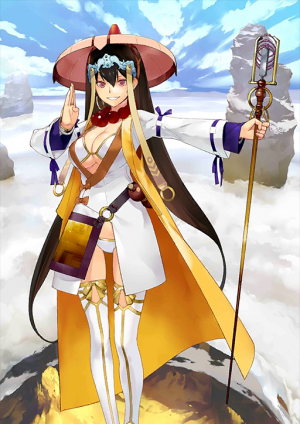 Xuanzang's Quick Attack is based on Sha Wujing's Monk's Spade. 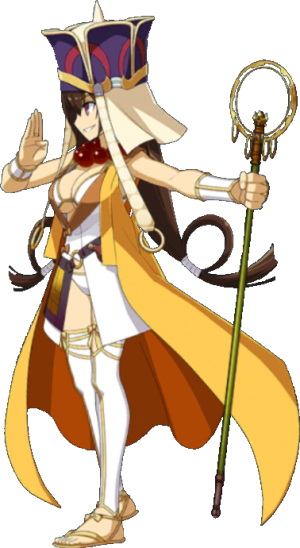 During her NP animation, Buddha of the Saver class from Fate/Extra appears behind her. This page was last modified on 9 February 2019, at 05:08.